Dark beauty with impressive, internal values. Basic maintenance work can be carried out yourself making it rare for the WMF Service Engineer to see your machine. With the patented Plug+Clean milk cleaning system, all milk-carrying parts are cleaned easily and in compliance with HACCP. – Confirmed by the Technical University of Munich. Almost any chocolate / coffee creation with lots of milk can be produced. 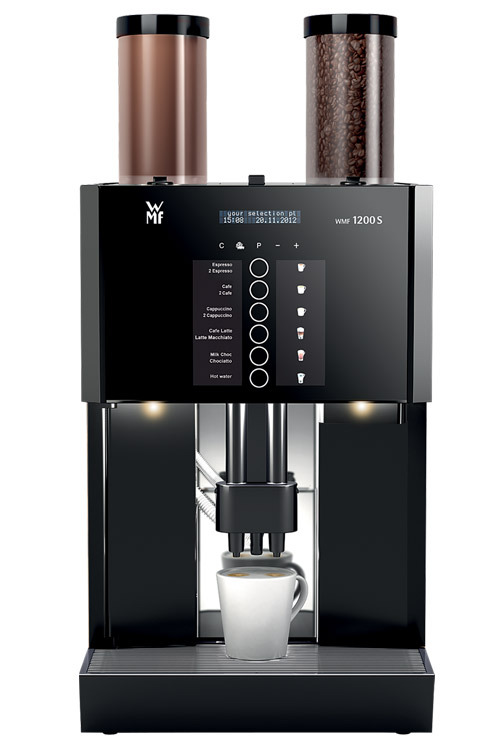 Depending on requirements and situation, a WMF 1200 S can be fitted with a water tank or fixed connection. At the press of a button. Saving time and reducing operating costs. allows individual designs and the easy replacement of button labels with drink names, prices or images. All the important functions and parameters can be set using the two-line display and five function keys. With three Eco modes and settings for an automatic switch-off, the customer can adjust their electricity consumption to their individual habits. When the WMF 1200 S is switched off, it is “off”. This means it does not consume any more electricity. By pressing the + or – button for a short or long time, a drink can be selected individually strong or mild, large or small. Two integrated LEDs underneath the front panel light up the spout and present your drinks in the proper light.